Provides information about interactive form field. Terminal field contains field value, field default value, field properties and widget annotation (Annotation) that describes interactive form field appearance. Not terminal field uses to create group of interactive form fields (Kids). 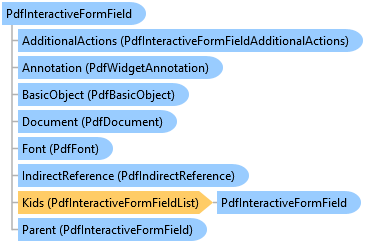 Interactive form field and annotation may include property that specifies an additional-actions (AdditionalActions, Vintasoft.Imaging.Pdf.Tree.Annotations.PdfAnnotation.AdditionalActions) that extends the set of events that can trigger the execution of an action. This trigger events may be used to create verification algorithms, calculated fields and custom fields interaction logic. This example shows how to create a PDF document with calculated text field.
''' Creates a PDF document with calculated interactive form field. /// Creates a PDF document with calculated interactive form field.